Comms supply specialist Rocom is hailing a new modular video conferencing solution from Logitech that ‘raises the bar’ in flexible high quality audio and visual performance. Logitech Rally is a premium, modular conferencecam that delivers studio-quality video, exceptional audio clarity and an automated video conferencing experience that can be tailored to any meeting space. Rally features Ultra-HD 4K video, modular audio components, expansive PTZ capabilities, and Logitech RightSense technologies that automatically frame people, optimise colour and luminance for human faces, and improve vocal clarity for more productive meetings. Its modular design makes it ideal for everyday conference rooms as well as boardrooms, classrooms and large meeting spaces, says Lee Preston, Rocom’s Senior Corporate Sales Manager. “Unlike traditional video conferencing systems, Rally separates the speakers from the microphones. By mounting speakers near the display, the audio is better aligned with video, and voices of far-end participants come from the front of the room, which is what people intuitively expect,” Lee explained. A modular approach makes Logitech Rally an ideal solution for meeting spaces of almost any size and shape. Rally Camera features 4K optics and intelligent PTZ features to capture every seat in room. The standalone microphones provide a superior audio experience and more effectively suppress noise and echo. The front-of-room speakers offer richer sound than tabletop speakerphones. Innovative cable management enables custom deployments and integration by AV professionals. Premium materials, streamlined cabling, and sleek industrial design complement architectural spaces and high-end furnishings. 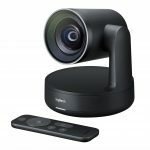 Lee emphasised: “Logitech Rally is compatible with almost any video conferencing service, such as Microsoft Skype for Business, Microsoft Teams, Google Hangouts Meet, Zoom, BlueJeans and more. The standalone Rally Camera with ‘RightSight’ technology is available now at an RRP of £1,299. The complete Rally system with ‘RightSense’ is due out later this year.